Viewing 24 of 310 items. Celebrate the season with this burgundy and gold border foldover photo card. Pre-taped to accommodate a horizontal 4 x 6 photo. 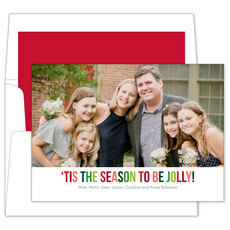 These cards are supplied with repositionable adhesive tape for ease in..
Every holiday season should be celebrated with this festive foldover photo card with an engraved Merry Christmas border. Your choice of photo options. If mounted style is wanted, the holiday cards.. Celebrate the season with our foil stamped Christmas photo cards featuring a gold foil frame surrounding your photograph. Matching blank envelopes are included. Photo cards come with a fully printed..
Set of stylish photo cards featuring our swiss dot foil design. Your choice of foil design color. Blank white envelopes included. Sized 7" x 5". 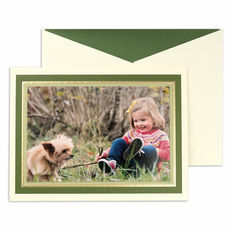 Optional printed return address and envelope..
Set of whimsical photo cards featuring your favorite photo. Blank white envelopes. Sized 7" x 5". Printed return address in flat black ink and optional envelope linings available. Your signature.. 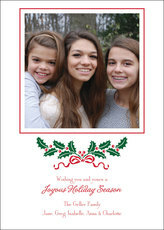 The season just would not be complete without sending out Holiday Photo Cards. It has become a tradition to open the mailbox and find a greeting from friends and loved ones. 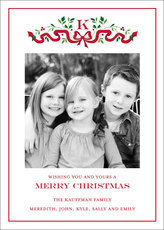 Set of flat holiday cards.. 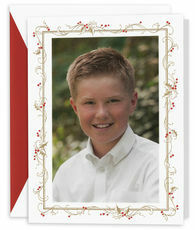 Celebrate the season with our foil stamped Christmas photo cards featuring your photo framed in gold foil. Matching blank envelopes are included. Photo cards come with a fully printed card back as..
Set of stylish photo cards with rounded corners featuring our Merry Christmas foil design. Your choice of foil design color. Blank white envelopes included. Sized 5" x 7". Optional printed return.. 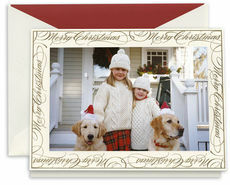 Delight friends and family with these charming Christmas photo cards featuring your favorite photograph. 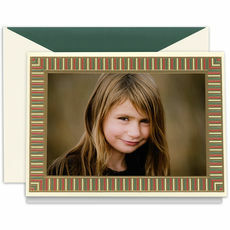 Set of flat holiday photo cards with blank matching envelopes. Sized 5" x 7". Your.. 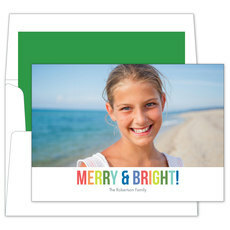 Celebrate the season with our colorful Christmas photo cards. Matching blank envelopes are included. Photo cards come with fully printed card back. Size of photo cards are 7" x 5". 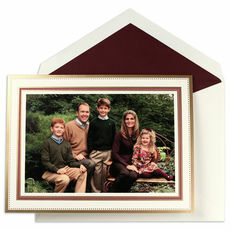 Flat..
Personalize the holidays with this custom photo greeting card framed by a modern color block border. Pre-taped to accommodate a horizontal 4 x 6 photo. 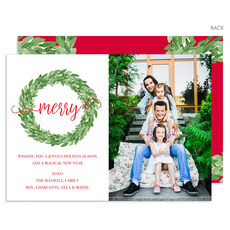 These cards are supplied with repositionable..
Our beautiful selection of Christmas photo cards features an extensive selection of designs and styles perfectly suited to be printed with your photos and text. 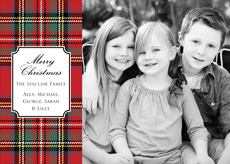 There are many vertical and horizontal designs available to fit your photo perfectly. 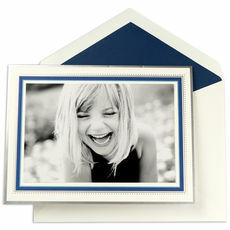 Free blank envelopes are always included with options for linings and return address to coordinate with your cards. 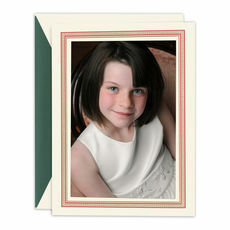 You can select to have us print your photo in full color, black & white or an artistic sepia tone. Excellent quality printing will be evident when you receive your order. We are here to assist you if you have any questions. Plus, we view every order before it goes to production to ensure excellence. From merry & bright to traditional designs, foil accented images and full card imprinting styles, you will certainly be able to find the style you are looking for. We also offer, on many styles, the finishing and edging of your choice at no extra charge including rounded corners, medallion shape and a scalloped edge, in addition to the traditional rectangular shape. We also offer easy-to-order tools online which prompt you to enter your personalized information and then the card is pre-formatted so you can easily create the look of the sample if you wish, or you can adjust wording and sizes to create the card imprint you want. 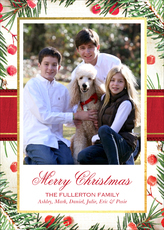 Make your Christmas wonderful and easy this season with the perfect holiday card featuring your family photo. We offer styles featuring one photo, two photos and more. Whether it's traditional or modern, whimsical or spiritual, we love the holidays and we want you to love your holiday cards too. So share the spirit of the season with your friends and family this year!